The government of Ontario has recently supported 12 collaborative projects between businesses and healthcare institutions to commercialize innovative medical technologies. Through the Health Technologies Fund (HTF), each research project will receive Ontario government grants to develop, test, and integrate cutting-edge technologies into provincial health care institutions. Health Technologies Fund will provide up to $5.5M in Ontario government grants in combined support for the 12 medical technology projects. HTF places a unique focus on increasing targeted at delivering ‘Better Care Closer to Home’, and as such, successful projects largely focus on communication technologies which enable healthcare professionals to communicate with patients at a distance. Project: Developing software for accessing online records to better manage cancer patients’ symptoms and avoid emergencies. Health Innovation Team: Cancer Care Ontario, Bayshore HealthCare Ltd., Princess Margaret Cancer Centre, University Health Network, MedChart Inc., Royal Victoria Regional Health Centre, Sunnybrook Health Science Centre/Odette Cancer Program, Windsor Regional Hospital and Southlake Regional Health Centre. Project: Developing software that helps professionals more accurately monitor health improvements/deteriorations in children. Health Innovation Team: Markham Stouffville Hospital, Bedside Clinical Systems. Project: Developing a pilot program which assesses and manages the risks of brain health screening, both at home and in hospitals. Health Innovation Team: Wilfred Laurier University, Saint Elizabeth Health, BrainFx and ThoughWire Corp.
Project: Developing a take-home kit which enables women to collect vaginal samples, mail them via Canada Post, and receive online results within a week. This speeds the testing process and helps women in more remote areas receive timely feedback. Health Innovation Team: Mount Sinai Services, Women’s College Hospital – Institute for Health System Solutions and Virtual Care, Saint Elizabeth Health, Eve Medical Access Alliance, Roche Diagnostics and N’Mninoeyaa Aboriginal Health Access Centre. Project: Developing logistics software to improve patient care by increasing at home visits with the same number of staff. Health Innovation Team: University of Windsor, Erie St Clair LHIN, Odette School of Business, World Health Innovation Network, Homecare Intelligence Inc., ParaMed Home Health Care and the Victorian Order of Nurses (VON). Project: Developing and testing a mobile application which allows patients to adjust medication dosages under a doctor’s supervision. Health Innovation Team: University Health Network, ManagingLife. Project: Testing a new digital ECG monitoring tool to decrease the difficulties after transcatheter aortic valve implantations. This technology can decrease the time patients must remain in the hospital after the surgery. Health Innovation Team: Hamilton Health Sciences and m-Health Solutions. Project: Testing a cloud-based platform capable of delivering remote care to youth with mental health disorders. Health Innovation Team: St. Joseph’s Health Care London, Lawson Health Research Institute, St. Michael’s Hospital Centre for Excellence in Economic Analysis Research, London Health Sciences Centre, Rogers Communications and InputHealth Systems Inc.
Project: Piloting a new device with a cloud-connected universal interface which allows people with low mobility to complete simple technology-related tasks from a wheelchair. Health Innovation Team: University of Toronto, McMaster University, Holland Bloorview Kids Rehabilitation Hospital, Kodo OpenLabs, John McGivney Children’s Centre. Project: Creating and testing a portable device that will notify and photograph bleeding in the brain for patients waiting for computed tomography scans. Health Innovation Team: Queen’s University, Kingston Health Sciences Centre, ArcheOptix. Project: Piloting software to compare patient symptoms with best practice guidelines and support the treatment process for vascular diseases. Health Innovation Team: Cardiac Care Network of Ontario, Women’s College Hospital. Project: Creating and testing an online care plan for all caregivers of a child facing serious health problems. The platform simplifies appointment scheduling and communication with health care providers. Health Innovation Team: The Hospital for Sick Children, NexJ Health. The Health Technologies Fund is an Ontario government funding program uniquely positioned for the practical application of new health technologies. Its funding supports collaborations between businesses, academic institutions and health care providers to improve and adopt these innovations. HTF covers up to 50% of eligible project costs to a maximum $500,000 in Ontario government grants. Although the program is currently not accepting applications at the time of this article’s posting, it’s expected to reopen later this year. 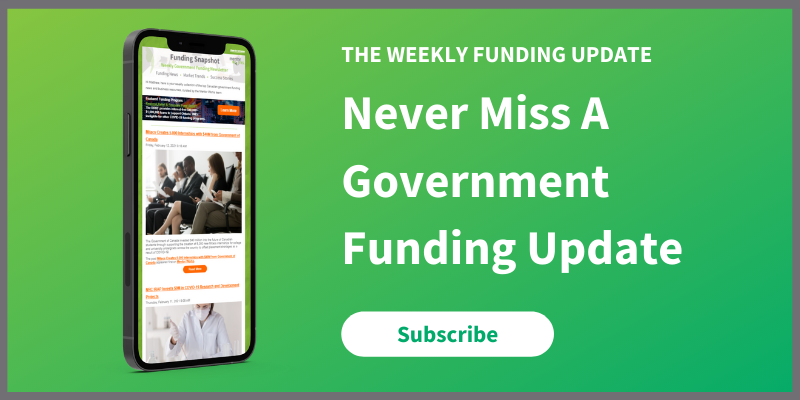 To stay up to date about when HTF will open, subscribe to the Government Funding Snapshot Newsletter.